Are you brave enough to enter the deepest darkest jungle caves of the rainforest? Join Gonzo on his quest for 5 reel glory and uncover the treasure that lies beneath the pyramids in this online slot extravaganza. NetEnt is a well-oiled combination of industry know-how, and innovation, delivering title after innovative title to the online slots UK industry. Their hundreds of games are created by thousands of staff, and lead to billions of transactions every year, in nearly 200 online casinos. If you enjoy online gaming, you enjoy NetEnt games. 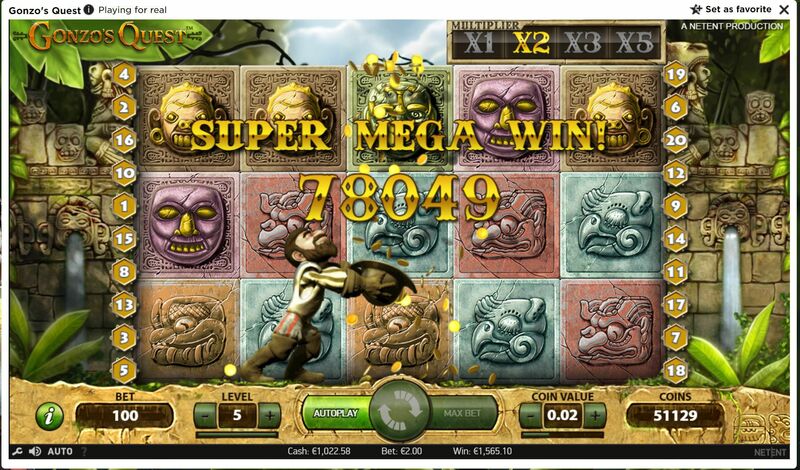 We also often run various bonus slots with this game. Inspired by the intrepid adventures of Spanish Conquistador, Gonzalo Pizarro, Gonzo’s Quest sees us join his journey to ancient Peru. 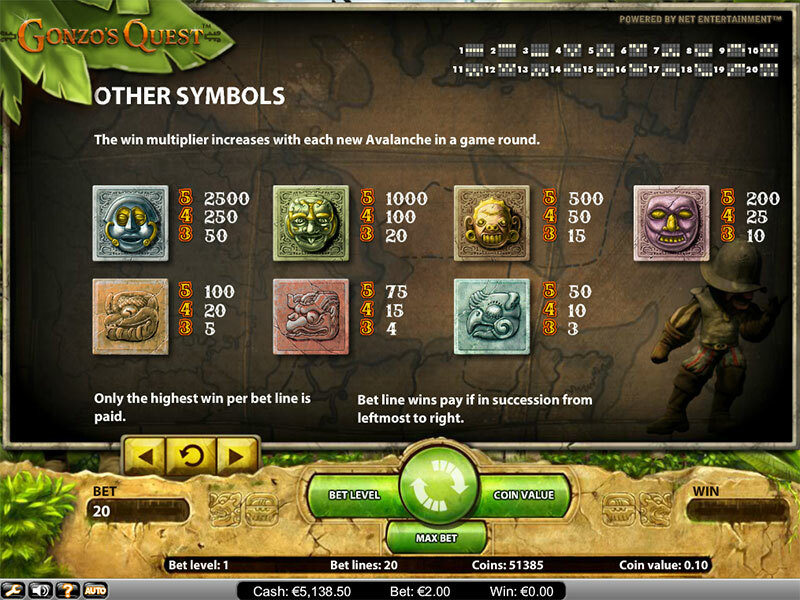 This 5-reel, 20 pay line online slot can be played from £0.01 to £0.50 per spin, and carries a potential jackpot of 2500 coins. From the moment we see the fantastic, introductory animation, it is obvious that we’re engaging with one of the coolest titles on the market. Apparently, back in ancient Peru, there weren’t any of the conventional symbols we’re accustomed to in the online gaming world. There were, however, a series of intriguing stone blocks which, when landing in certain combinations, will reward the adventurous with substantial wins. There are 7 standard Block Symbols in the game, each one carved out of a different coloured stone, and each one with an original face of man or beast. The blocks tumble into 3 rows of 5 columns, and if a series of these blocks land together, they will explode – leaving a nice cash bonus, and room for more blocks to appear. This means that from a single spin, there can be an endless number of winning combinations, with the multiplier on every win increasing all the way up to 5 – and this is without the Bonus Features. The Free Fall symbol, a shiny golden block, will trigger 10 Free Falls when we land 3 on a betting line. There is also a Wild symbol; a grey block with a Golden Question-mark symbol, which will substitute for all other symbols. During the Free Falls feature, the multiplier is tripled – meaning wins can carry up to a 15x coin bonus. Along with the innovative ways to win, the graphics and audio within the game are superb. The SFX of the blocks falling, and exploding when we win, is certainly an engaging aspect of the game. Gonzo himself is present during the game, inspecting our progress in his quirky Conquistador outfit – head-to-toe in adventurous khakis. He will occasionally check his map, to make sure we’re on the right track, or wipe a mosquito off his face – but he will always be delighted when we land a big win! Gaming to the pleasant sound of jungle cicadas is an original, and very cool concept, courtesy of NetEnt. You can almost feel the heat of the Peruvian jungle, and the SFX of the blocks tumbling and exploding is so real we expect the ground to shake with every win. Gonzo is a quiet, but very cool gaming host, and is part of a wonderfully engaging game. 9/10 from Dream Jackpot – happy adventuring! Now try our Lucky Leprechaun. 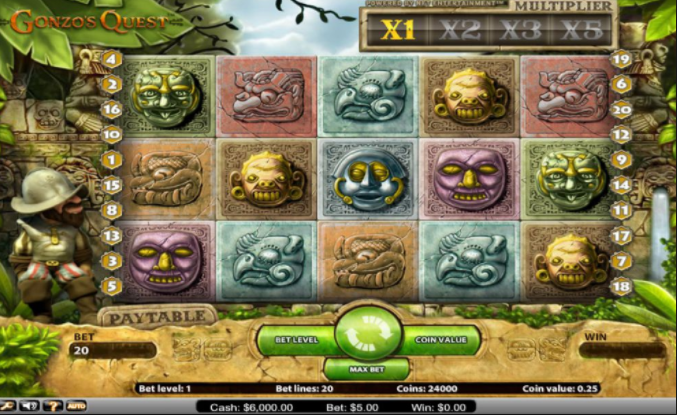 For more slot games discover here.